Interactvice Sustainable Development Goals - nexxar lab. But how do companies communicate the SDGs in their online reports? Sustainability and Integrated Reports are becoming more colorful. 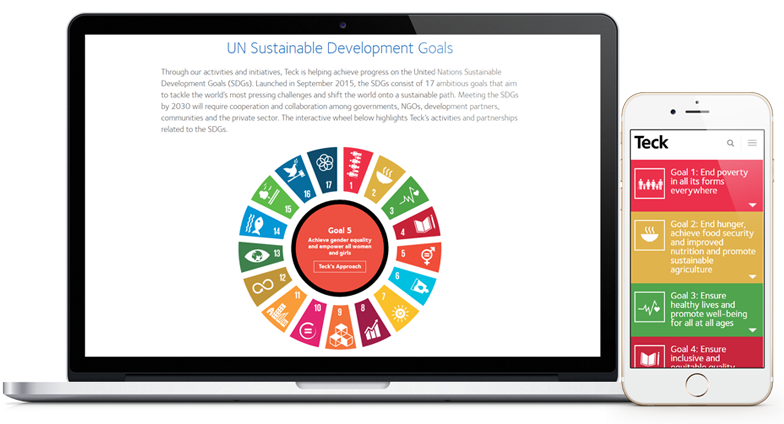 About a year after the launch of the Sustainable Development Goals (SDG) on September 25th, 2015 the 17 colored SDG icons appear in many reports. A new survey analysing 163 world-leading companies also shows that many organisations (42%) already use a digital-first approach to report on Sustainable Development. What is the relation with the SDG (positive & negative)? The most common way is a simple table, which contains information on the goals, contributions and further links to projects (see Telekom or Volkswagen). 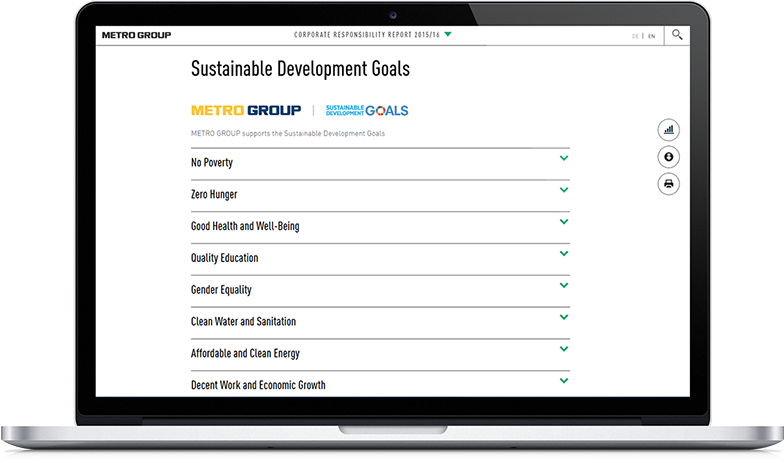 Using a accordion solution the Sustainability Report of METRO GROUP provides a good overview of the SDGs. Based on the “color wheel” (see SDG styleguide) the Canadian mining company Teck created an interactive SDGs wheel. For each of the 17 goals Teck provides information about the approach and shows working examples. On mobile devices the wheel turns in an accordion solution. Brambles created an interactive info graphic for their 2020 Sustainability Goals. The solution includes information on the strategy for achieving the goals and links each goal to one or more of the SDGs. We also like the way SDG Fund is showing how their programmes are contributing to the Sustainable Development Goals. Unfortunately this project overview was not thought for use on mobile devices. Bosch’s visualisation in last year’s Sustainablility Report focuses on moving elements. Additional links to more information would be an improvement.